Available Widths: 3" or 4"
For use with Loop or Berber Carpet. Not for use with cut pile carpet. 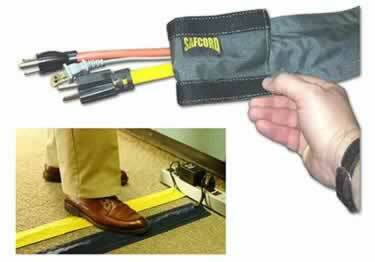 Simply press on the Hook and Loop Cord Protector to carpet and safely secure cords while eliminating tripping hazard. Available in 3" or 4" widths and a variety of lengths and colors. Perfect finishing touch to your flooring. 11 profiles and 30 colors, these rubber reducers complement any interior design. Create the perfect transition from carpet to carpet, ceramic, tile, or resilient flooring. 39 color options. A Koffler exclusive, you can paint and match any color wall. Made from a specially prepared paintable material.